When NASA announced last week that it had a new discovery "which would impact the search for evidence of extraterrestrial life," the media clamored for details. But when the space agency finally unveiled the news that it had found alien life in the form of a microbe with previously-unknown DNA that that feeds - oddly enough - off of arsenic, journalists were unimpressed. 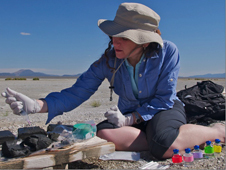 They were hoping for ETs on another planet, and so were disappointed when it was "just" microbes found in Mono Lake in California. The discovery raises the possibility that "shadow" life may exist on earth—and perhaps even on other planets. There might be other microbial life forms out there that have, over billions of years, been forced to modify basic DNA in order to survive in toxic environments. There will now be a surge of scientific interest in finding new variations in the DNA molecule, and also finding new organisms that exploit these mechanisms. Arsenic-based DNA are, one hopes, not the only exotic forms of DNA in the universe. Kaku writes that, in light of this discovery, NASA is likely to re-consider its program to find life on Mars, as well as its investigations of the moon of Saturn, Titan, or the moon of Jupiter, Europa. He also notes that there is the possibility of industrial applications. I love the fact that this discovery was sitting under our noses, as it were, in California - we just didn't know what we were looking at. The lesson is that it's not the material in itself, it's our knowledge that enables us to understand and use resources differently: just as in ancient Rome, when coal was used jewelry and was not imagined as a source of energy (as Brendan O'Neill points out here). I also like the dialectical interaction between our understanding of Earth and other bodies in space. Just as this discovery will have us re-examining soil samples from Mars (because we will now be looking at them to find something else), likewise future discoveries on other planets and moons are likely to increase our knowledge of our own Earth. There more things in heaven and earth, Horatio, than are dreamt of in your philosophy.